This weekend I took a wander down by the canal. Still feeling jarred and not really quite sure what to do with myself. I needed to head off away from my usual paths. Driving along I noticed a sign for a jumble sale in a village hall on the way. I quickly turned the car around and headed back on my route to find a cash point! I still had an hour until it started and a dog needing a walk. So I parked up near the village hall and went for stroll. The little village of Frampton on severn, feels almost lost in time. It's reputed to have the longest village green in the UK. Around the edge of which I've never seen so many original tudor houses in one place. It's a place somehow a bit cut off geographically, curled around by the River Severn. I imagine the village pond had seen many dunkings in it's medievil past. Actually it felt a bit strange walking around. Like I might not actually find my way back out! a kind of spooky comic for girls. just like something out of snow white. and hoped no dogs had found their way there too! 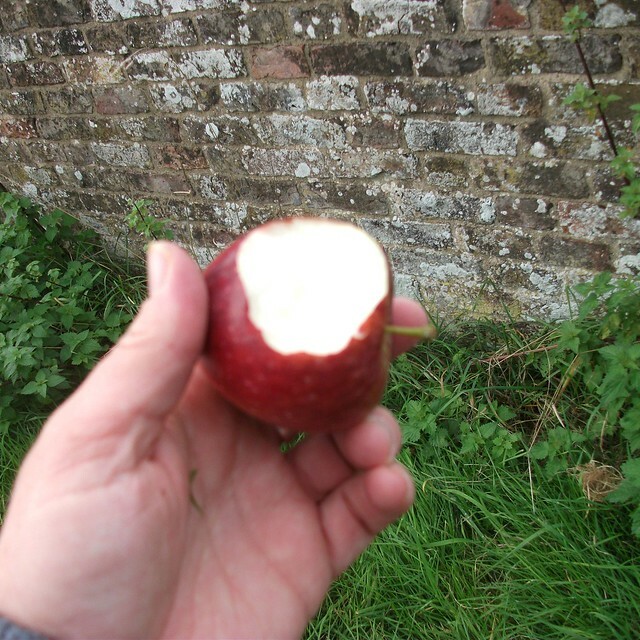 a distant forgotten appley memory. it would still be there waiting. I couldn't remember being in a jumble sale since my childhood. I would go with 50p and buy a bag full of clothes. Inside there were long tables piled several feet high with clothes. determined ladies armed with laundry bags!! people on the floor under the tables scrabbling amongst the clothes! the idea seemed to be that found your place, dug in your heels and riffled through your section. I didn't have the emotional stamina for that! and I didn't even need to go to the cash point.......! which compliments my navy blue cushions really well. and this room's cozying up now. Thank you for all your moral support on my last post. There's always the chance that a new direction could lead to good new things. 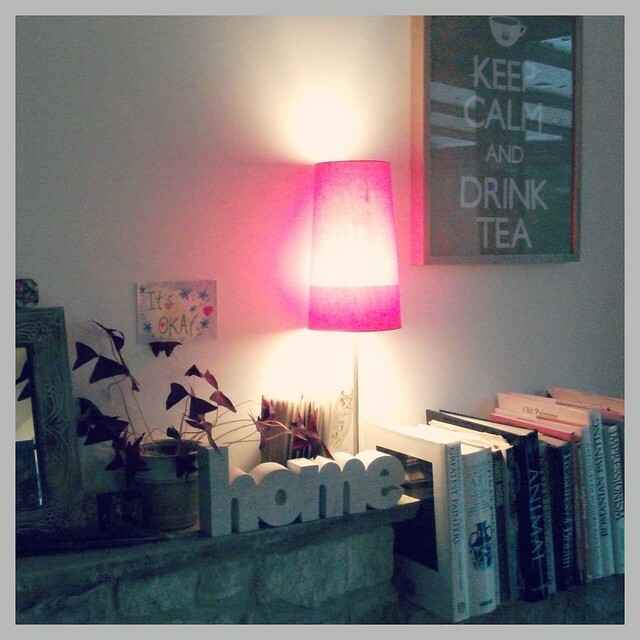 Your new lamp is so pretty Heather, and your cosy corner looks even cosier bathed in soft pink.Such a lovely post, always from the heart! I'm wishing you and your teenager the very best of the best! your girlish cosy corner is really nice and relaxing!!!! I am just so envious of that gorgeous little village! I would love to walk for miles there, of course "Miles" might be pushing it, but I would love to walk around there and would have loved that sale... 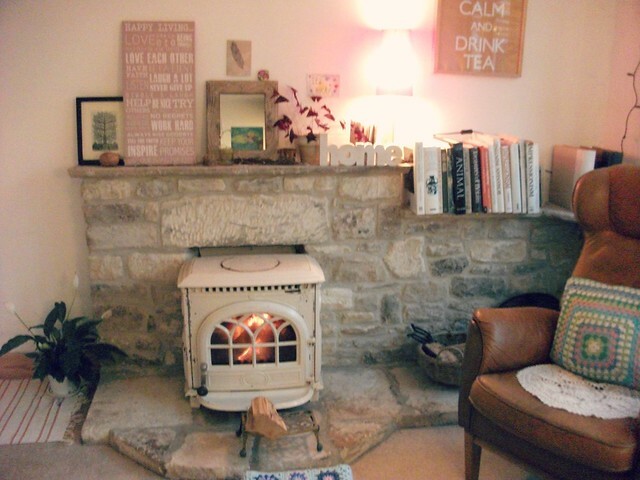 Your home is simply lovely, I love everything about your fire place, especially all of those awesome books you have lined up and the inspirational wall hanging, the pink light just gives it a bit more of a "something" as well... Relaxing here must be wonderful. Hang in there Heather, the teenage years don't last forever, I have 2 grown men now and they are just lovely creatures now! (As you know I have a 17 year old I often want to *)#*)*$#)... but I know that "This too shall pass", you're awesome for taking a class to learn more of teenage ways, it just shows what a great mum you are. What a great find and all for 20p. I have a little basket that I bought for 6d at a jumble sale when I was about 7 and I still have it and wouldn't part for the world. Hi Heather, I felt like I was with you on your walk around Frampton on Severn. Thanks for sharing. Yes I remember those jumble sales in the local village hall. Great memories. Just catching up here Heather :) That is a heavenly lamp, but I'm sorry to read that things have been tough enough that you needed the boost of finding it. I used to love a good rummage at a jumble sale!